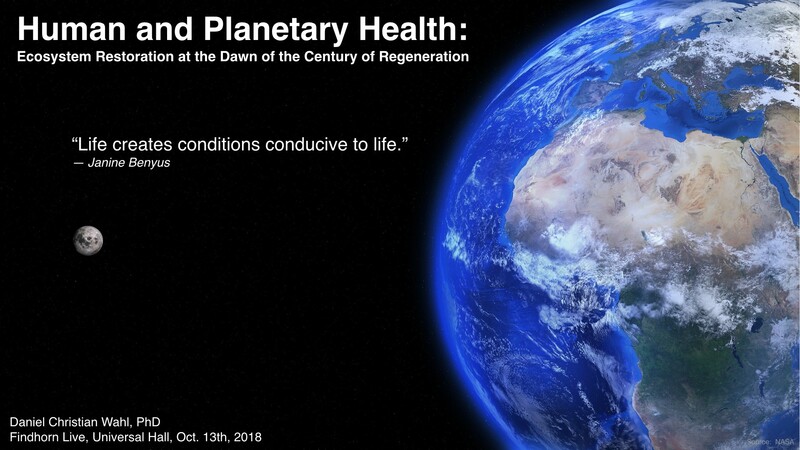 […] I like starting with this slide of planet Earth because it shows the atmosphere and how thin that layer of life — of biosphere — actually is. Within it we take our home, within which everything, every love, every war, every bit of human history has taken place. There is not a thing that you and I can do that does not affect the health and wholeness of this place. Unfortunately we have come through centuries, if not millennia during which we have not been very wise about how to behave within that living planet. These slides might be familiar to some of you. 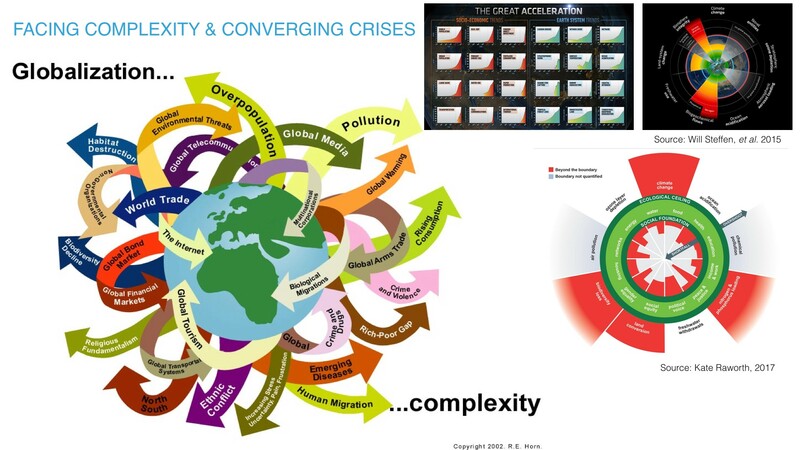 This is the planetary boundaries graphic [upper right corner of image above]. 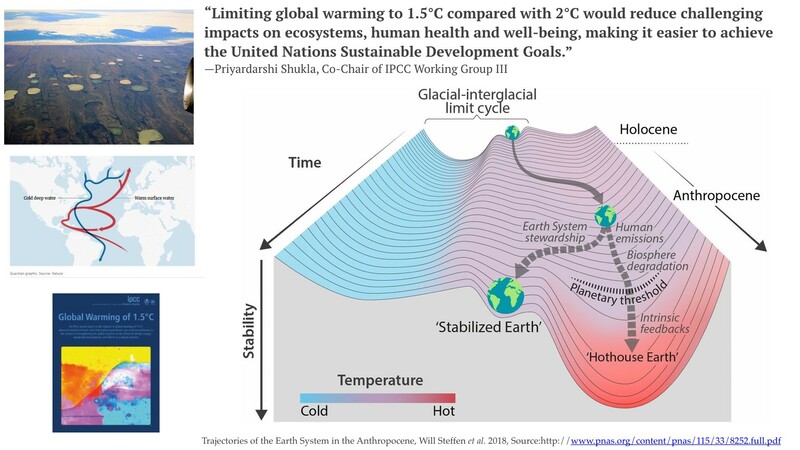 It shows that we are already beyond certain planetary boundaries, that if we don’t draw back within the safe limit of these planetary boundaries we might not have a future. There are lots of things coming together, economic crises, ecological crises, social crises. My friend and mentor Fritjof Capra once said if you follow the rivers of these crises upstream, you meet a crises of consciousness, a crises of perception. A crises of how we see our selves and our role in this living planet. Also: We live on an incredibly unequal planet. 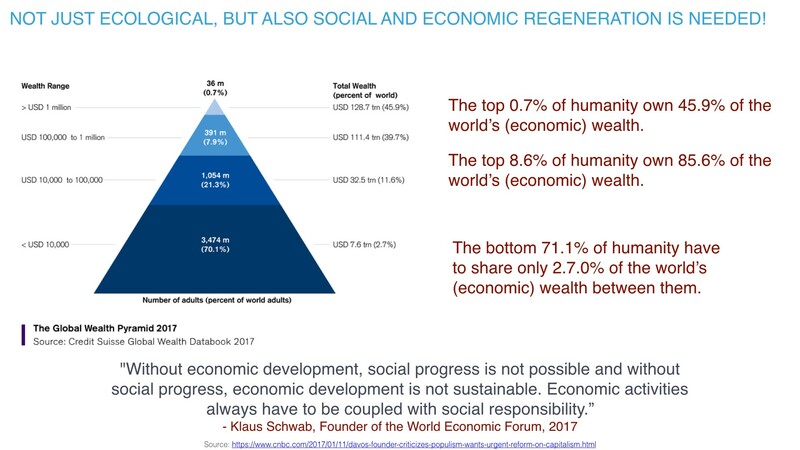 If you sum up the two top layers of this graph produced by Credit Suisse every two years, 8.6 percent of humanity own 85.6 percent of the wealth — which is staggering. What is even more staggering is that 71 percent of humanity have to share 2.7 percent of the wealth. We cannot create a sustainable planet — or a sustainable future for humanity — with this inequity. And, we wouldn’t want to sustain a humanity that is that unequal. Just at the beginning of this week, the IPCC — the panel of climate change — released another report saying while we are completely off-target regarding what was agreed in Paris — with a two degree target — it is actually not enough. We need to radically reduce carbon emmissions and actually do more than that. We need to reverse carbon emissions to avoid ‘hot house Earth’. We are on this path (see slide aove) and if we don’t manage to take the detour onto this semi-stable ledge, we are dropping into this abyss. About two weeks ago the Secretary General of the United Nations said that we have about a year and a half to take drastic action. The IPCC report — again very conservative — is talking about 12 years. We are basically faced with a run-away cycle now, where climate change is getting worse even if we are starting to paddle back. So even if we do all the things that I am going to be talking about this evening, we are facing three decades of collapse. That collapse is the collapse of an old system that no longer serves, that we have to go through in order to give birth to a new humanity that sees itself again as part of the community of life. So even if we get things right we will still face three decades of quite severe upheaval. I uploaded a copy of this talk in my Facebook page in November 1st and by November 7th it had gained more than 14k views. Please help spread the link to the Youtube video to people you know who care. Here is the link to the same talk on Facebook — still being shared and viewed by more and more people. Regeneration Rising! Daniel Christian Wahl — Catalyzing transformative innovation in the face of converging crises, advising on regenerative whole systems design, regenerative leadership, and education for regenerative development and bioregional regeneration.